My kids adore ride-on toys, especially ones mom will let them ride in the house on the hard wood. We have another brand ride on, but with two kids wanting to ride at the same time we welcomed a second. When our Pillow Racer came in the mail I couldn’t get the photos taken quick enough for their liking. This fun riding toy can be used as a cuddly stuffed animal and pillow! Ride it, race it, love it! The stable base and easy-to-grip handle make the Ladybug Pillow Racer a super-fun indoor riding toy. • Maximum weight limit up to 50lbs. 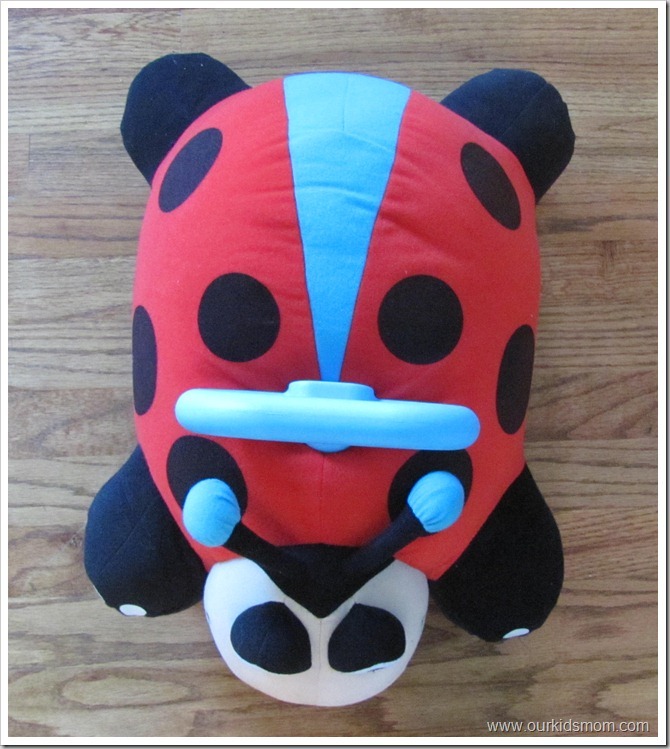 This little lady bug was simple and quick to put together. Her padding makes the seat a comfortable spot for little tooshies and the rolling casters make getting around easy and fun. 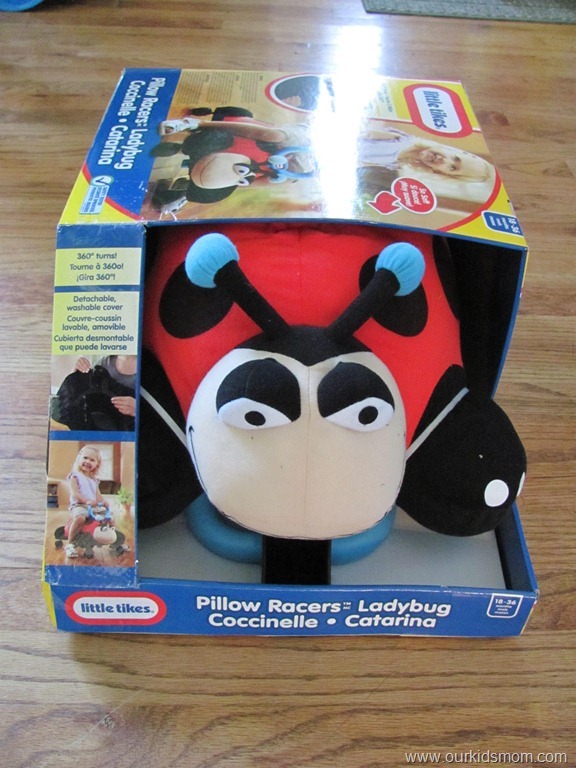 When I first read about the Pillow Racers I had visions of much younger children playing on them. I had intentions of gifting this to a younger cousin, but after watching my three and five year old having a blast on it I think it’s a keeper! The weight limit is a generous 50 pounds, which should allow Emma (age 5) to play on it for at least another 4-6 months. Ethan is just at 40 pounds at almost 4 years old. He can continue to use it for quick some time. It’s a simple concept that allows the kids to scoot around (feet powered) with an adorable and soft exterior. I have found that some of the simplest concepts are the best toys! ONE OurKidsMom reader is going to win a pillow racer! This giveaway ended at 11:59 PM EST on May 11, 2012. I’d love any Little Tykes outdoor play/climb sets for my 3 youngest kids. Thanks for the chance. Would love to have the Endless Adventures® Rock Climber & Slide. 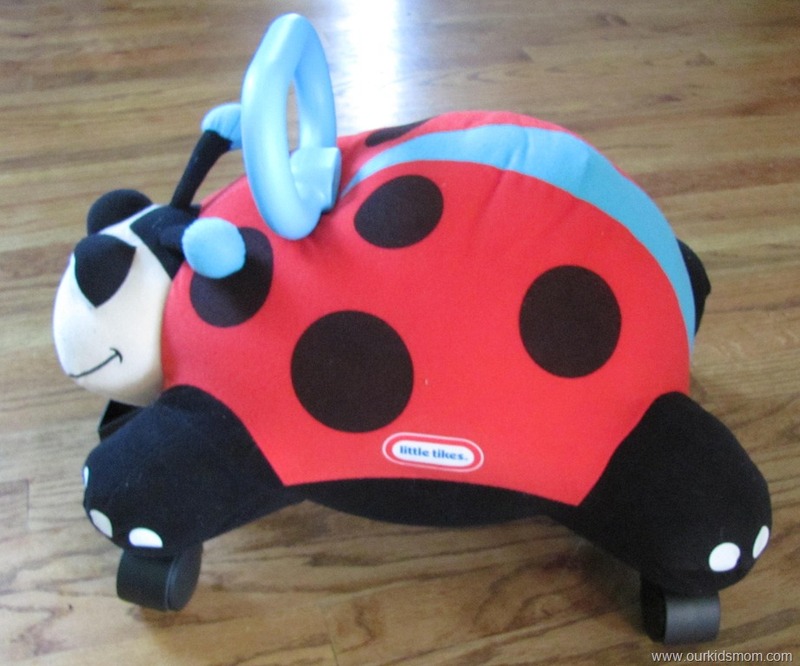 I want a pillow racer for my daughter! I have always been a fan of the Little Tikes brand, since my 18 year old was a little tike lol. I love the little Roll ‘n Pop Vac. I had my own version when I was a kid in the 50s. My FB name: Kathy Newsom Davis… if I am the winner. The Little Tikes Sort and Store Toy Box is something we could definitely use! I want the princess dozy coupe with glitter for my little princess! My son would love the bubble leaf and garden blower. He loves bubble and being out side. I would love the lady bug pillow racer. So darn cute. My niece would get a kick out of it. The kids would love to have the Rocky Mountain River Race. I like the Hidden Pirate Treasure Sandbox. I like the Picnic on the Patio Playhouse. I would love to have any of the outdoor playcenters. The only new thing that I learned from Little Tikes today (because I absolutely love their stuff already) was that I really don’t have enough money for all the stuff I want. Or enough room. I need to get a place with a yard. I would love to win the dinosaur one! 🙂 very cute! What a cool toy you got here. I want that to for my little brother. it is very nice. 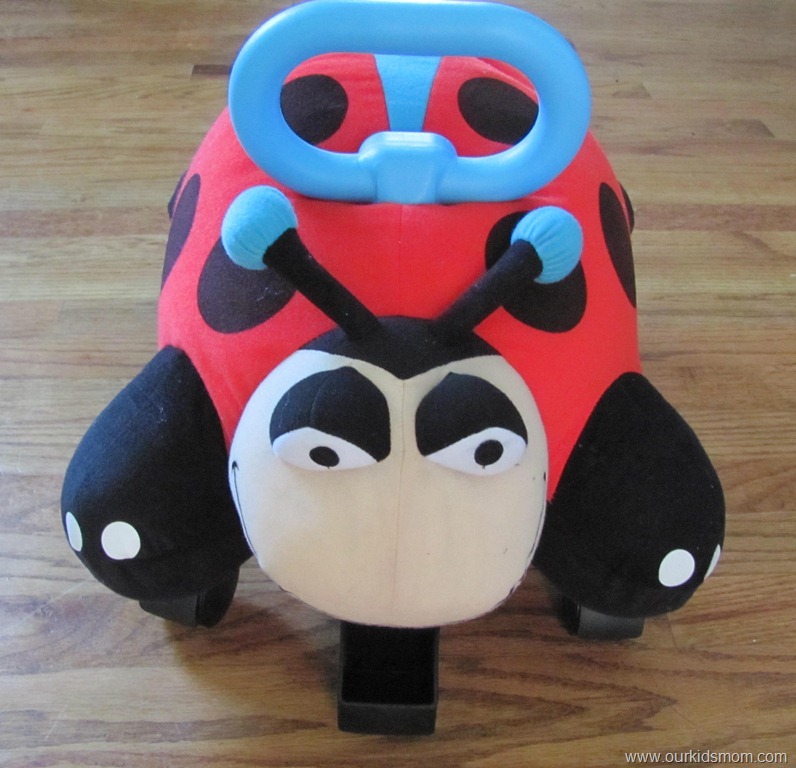 I would love to get my son’s the Tikes Patrol Cozy Coupe! Love it!! The deluxe wooden kitchen and laundry set! Role Play 2 Bundle! So cute! I love this contest. This will help my little one learn to walk and my toddler play! I really love the outdoor sets! i love their deluxe wooden kitchen, we’ve been looking into getting a kitchen for the kids and it looks super cute, especially since it has a washer too! I would also love the Thomas and Friends table and chair set. I love the whale teeter totter! What a great give away! My little Lily would LOVE this! I love all the pillow top ride ons and would love to have the wooden kitchen set. Our backyard is full of little tykes toys. lol. Very durable and reasonably priced. 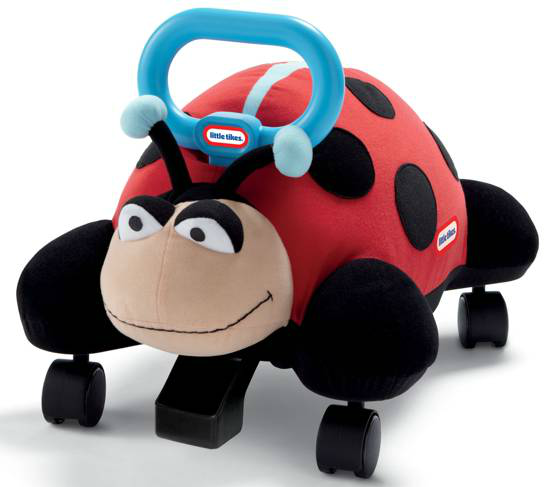 I really want to get the pillow racer for my little one. He is turning 3 in June and saw the commercial and just loves them. i love the classic castle playhouse!!! I want the 8-in-1 Adjustable Playground. My daughter would flip over the Classic Doll Buggy! Looks cute for my toddler! I’d love to try the TikeStix! I also like their Builder’s Bay Sand & Water Table. I like the 2 in 1 Garden Cart and Wheelbarrow. I love the Lalaloopsy dolls! I’d love to have them all. LOL! I’d let my 2 neices play with them. I absolutely love this giveaway! My neice loves lady bugs. Thank you for the giveaway! 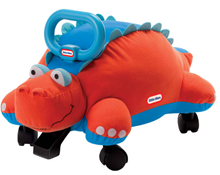 I really love the 3-in-1 Trike with DiscoverSounds® Dash (Orange). I like the Little Tykes Playground. I like the Builder’s Bay™ Sand & Water Table. I love the Builder’s Bay™ Sand & Water Table! I really like these pillow racers.My son wants one. I like the Classic Whale Teeter Totter! I would love to get my kids any of their outdoor toys. I especially love the classic castle. Thank you for the chance to win such a fun prize! I would love to have the classic castle for my kids. I love the Lalaloopsy Sew Cute Playhouse!! Lately I’ve really been wanting either one of their picnic tables or a ride and relax wagon! Island Adventure Water Table looks like fun. 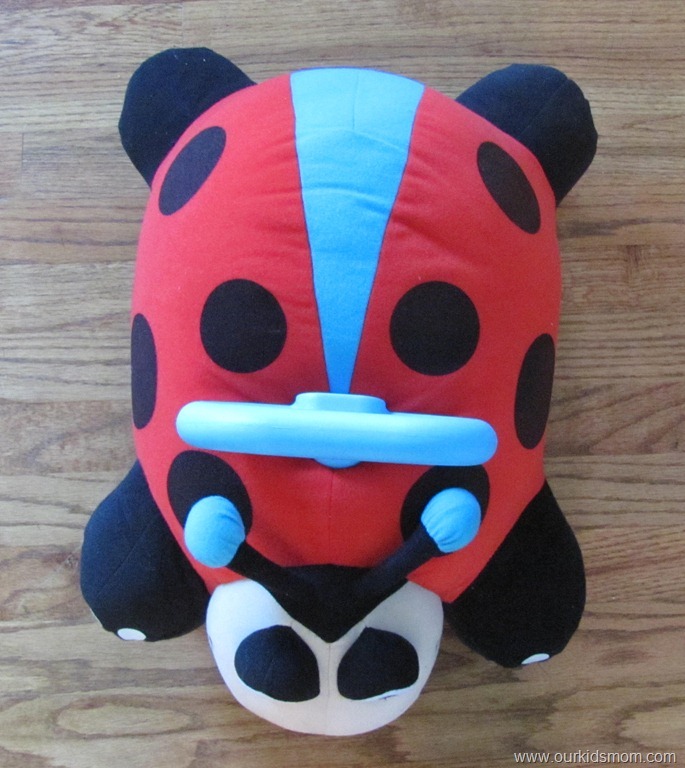 I like the ladybug pillow racer. I love the lalaloopsy dolls! I also like the Little Tikes 3-in-1 Trike. I would love to have their turtle sandbox. My daughter doesn’t understand that the neighbor’s one isn’t hers. I like the Junior Sports ‘n Slide Bouncer. I LOVE The lady bug one, that is my favorite! I love the classic castle! It seems like I did this but I can’t one. I’d love a Little Tikes 3-in-1 Trike! The little tykes picnic table. I downloaded the pledge to put on my blog as we are in the process of switching it. Does that count, my firefox won’t let me go to the pledge til I am with Google Chrome. I like the classic castle playhouse. I love the cozy coupe cab! I want a Lalaloopsy Doll. I would love to have the 3-in-1 Trike with DiscoverSounds® Dash. those tikesticks looks like fun! i would love to have one of those tikes picnic tables. it would be perfect for summer lunches in the backyard. I’d love one of the outdoor playsets for my kiddos! I didn’t realize Little Tykes made so many! I use the email juliihack@gmail.com to subscribe to rss/emails. I’d like any Little Tykes outdoor play/climb set. I really like the Endless Adventures Fold ‘n Store Picnic Table Combo ! Thanks for the giveaway! The clubhouse climber would be great to have. I think my daughter would really like the 2-in-1 Garden Cart & Wheelbarrow. I would love the picnic table for my visiting grandchildren this summer. The easy store table with umbrella would be perfect for our backyard! My little Grand kids would love on of the playhouses. That would be nice. I also like the Race ‘n Re-Fuel Pit Stop™ Playhouse. I learned you can order toys directly from Little Tikes. I’d also love the Princess Cozy Coupe with Glitter for my girls! I like the Classic Pickup Truck. So cute! Id love to have The Slide Away! I, personally, am in love with the Lalaloopsy dolls, but none of my children like them! I’d start a collection for myself, haha. I love the 3-in-1 Trikes! It would be awesome to have one for my toddler so when his big sister wants to ride her bike he can too. I really want the “Deluxe Ride & Relax® Wagon with Umbrella” for my daughter. She would love this toy. I love the Backyard Barbeque™ Get Out ‘n’ Grill – it’s so cool! I love the classic pick up truck! I like the Swing Along Castle-Bright climber. 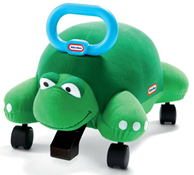 Little Tikes has been around for awhile & makes safe toys. I like their assortment of outdoor climbing toys & centers and sand & water toys. love the Deluxe Sports Bundle with Bonus Bag! My daughters would also love the 2-in-1 Dollhouse Playhouse! Thanks for the awesome giveaway! I like the easy store table w/umbrella. It’s perfect for summer. I love the Endless Adventures® Rock Climber & Slide. would be great for summer. The kids love to play in water. The Treasure chest sandbox is awesome. Thanks for the chance! In an ideal world, I’d love to have the 2-in-1 Wet ‘n Dry Bouncer .